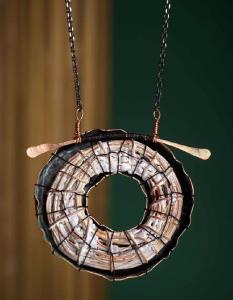 Are you familiar with Mary Hettmansperger's metal jewelry style? Very industrial and often rough and raw. I love it love it love it, but I know it doesn't appeal to everyone, so it's something you should be aware of before you buy this book. The other thing you should know is that Heat, color, Set and Fire is not a beginner's book. I would strongly suggest that you know the basics of metal fabrication before tackling most of these projects. And what glorious projects they are! 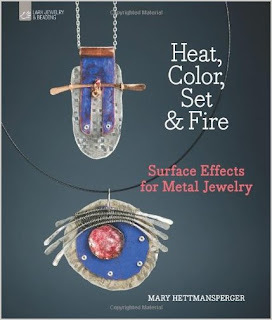 Like all excellent Lark Books, Mary's book covers many of the basics, but when it comes to working with a torch, there's no substitute for hands-on experience. 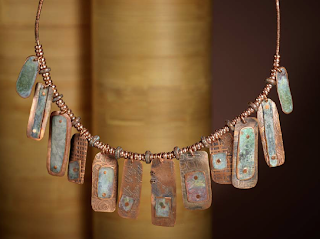 That said, these are fabulous projects, including wonderful techniques like adding patinas, enamel, keum boo, etching, fusing, weaving, and many forms of texturing. Personally, I am very motivated to look further into adding color to my admittedly few metal pieces I create each year. Epoxy putty and grout have joined my list which used to only have epoxy resin and liver of sulfur on it! Even if you aren't a fan of industrial chic, the ideas presented in the projects section could easily be morphed into pieces that feature elegant classical shapes and finishes. For me, the low tech hammered findings that Mary specializes in have me so excited that I'm anxious to try some new metal pieces, and soon!